One of the things I enjoyed doing in Male, Maldives was watching the sea planes. Adjacent to the airport sea planes are berthed and during day time, at regular intervals you can see sea-planes take off or land. Because we are not that used to sea planes, it was exciting to watch them up-close. This post shares my photos of sea plane and few video clips. Hope you will enjoy the photos. Above one is the best of the lot- very close, right over my head and manage to click just in time, though a part of the wing has gone out of frame, I think it is a good shot- your comments are welcome. Other photos are not that close, but show the sea planes in action in various angles. There are many resort islands in Maldives, to reach which sea planes are the preferred options, if money is not a constraint. Other cheaper option is to use speed boat, which is more time consuming than a plane. 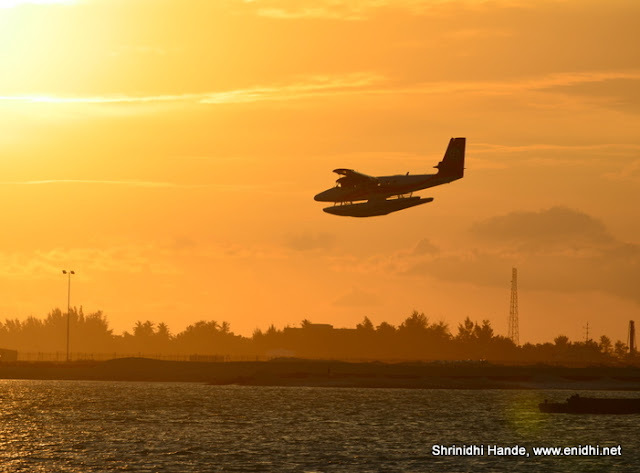 Seaplane ride in Maldives cost between USD 250 to 450 per ride per person, depending on the distance. Some ultra-luxury resorts charge extra to factor sea-plane cost and offer complementary sea plane pickup and drop off, whereas other island resorts may offer seaplane transport as optional extra. You can also book just a seat on one of the scheduled flights as well- Check this and this websites . It was a bit beyond our budget, so I didn’t try it this time, but have added it to my wishlist and will try some day for sure. Though the sea planes appear very small, each plane can seat about 20 people-usually 18 passengers and 2 crew, in a cramped fuselage. Also note that sea-planes fly during day light only (they only have visual rating, not instrument rating) and subject to clear weather. If weather is not favorable your ride may be cancelled and you should have a backup plan. Everything in the Maldives is costly but then, it is understood. Having said that, 250 USD still seems a lot for a hop. Try the Port Blair - Havelock sea-plane which is much cheaper, around 4400 INR I guess.